I call this one “Ornament,” because the leaf is hanging from pine boughs and the bokeh looks a bit like Christmas lights. Photography. With a little life thrown in. 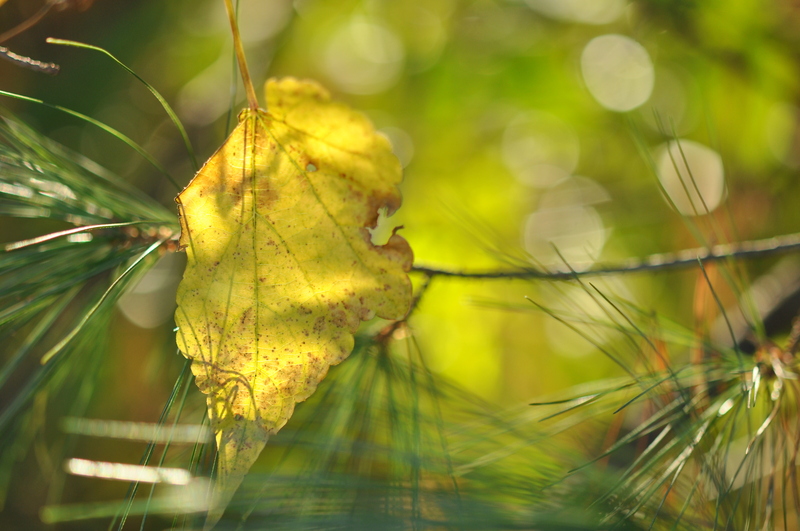 This entry was posted in photography and tagged bokeh, leaf, pine boughs. Bookmark the permalink. Beautiful shot! I love all the different textures and shades of green, so lovely! This is different. I was wondering if the air was humid and if this creates the impression of Christmas lights or just the way it is shot. It almost looks like two seasons, the dead leaf and the fresh looking light green pine. Fabulous shot. I love the shadow on the leaf. It’s so pretty! Flickr here we come. Thanks, everyone! I’m sorry I don’t have time to comment individually–crazy busy right now. Hope to have more time tomorrow…. ah. who doesn’t love a lovely leaf!? my daughter always slows us down collecting them wherever we walk.